Delegates and visitors fill the plenary hall in the May 1 afternoon celebration of Pan-Methodist Full Communion at the 2012 United Methodist General Conference in Tampa, Fla. On the screen are Bishop Sharon Rader and Bishop John White. 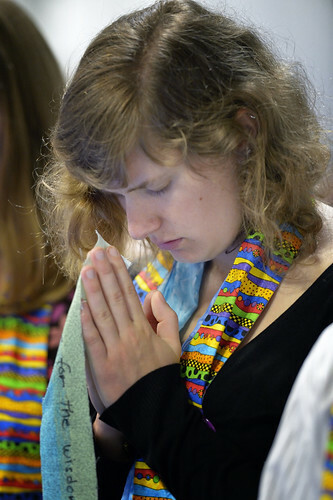 United Methodists from five continents addressed a wide range of challenging issues, including church structure and human sexuality, and engaged in an Act of Repentance toward indigenous people during their 10-day legislative gathering. Meeting in the Tampa Convention Center, steps away from the waters of Tampa Bay, the 988 delegates recalled through worship, song and sermon the healing and transforming ministry of Jesus beside the Sea of Galilee. As storms on the Sea of Galilee alarmed the disciples, so too, conflicting stands on structure and social justice issues troubled the delegates and some 4,000 visitors and staff. Perhaps the most surprising lightning strike occurred at 4:30 p.m. on May 4, the final day of the assembly, when the delegates received word from the church's supreme court that a major piece of legislation regarding restructuring violated the denomination's Constitution. Afterward, Bishop Larry M. Goodpaster of the Charlotte (N.C.) Area, outgoing Council of Bishops president, sought to comfort a frustrated assembly at the start of the evening session. "God always provides a way," he said. Decided not to divest from three companies whose products are used by the Israeli military in the occupied Palestinian territories. The delegates, from more than 60 nations, processed some 1,200 petitions during the assembly. General Conference meets every four years and is the only body that speaks for the 13 million-member denomination. 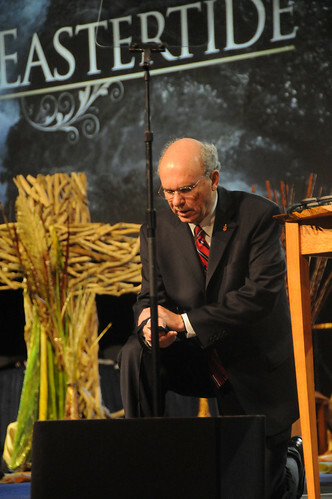 Bishop Peter Weaver of the Boston Area prays at the end of the Episcopal Address on April 25. He prepared and delivered the address on behalf of the Council of Bishops. A UMNS photo by John C. Goodwin. Click on image to enlarge. View more photos. Church restructuring received more attention from delegates than any other issue. Plans for a new structure that had been evolving over the last year and finally hammered out after a weeklong struggle took a major hit when The Rev. L. Fitzgerald "Gere" Reist, secretary of the conference, announced that the Judicial Council had ruled the newly established structure unconstitutional. Delegates and visitors reacted in stunned silence and scattered applause. After a 10-minute recess, delegates returned to their chairs. "We need time to consider what just happened," said Bishop Jeremiah L. Park of the New York Area, who was presiding over the session. The body adjourned until 7:30 p.m. The Judicial Council found several problems with the new structure. The nine-member "Supreme Court" of the denomination said that the plan called for the creation of a 45-member General Council on Strategy and Oversight that would have "authority for consolidation of administrative services to the extent practicable. &ellipsis;"
"The Constitution authorizes Council of Bishops to bear the responsibility for general oversight," the court said. Judicial Council members said they did not review the "tortured process" by which the plan had been approved "outside established legislative processes." They did review the plan itself. "We have reviewed the plan to determine whether any part, portion, or all of Plan UMC can be saved and conclude that it cannot. The broad delegation of legislative authority and the commingling of the role of oversight so inextricably permeate the plan as to render it constitutionally unsalvageable." During the dinner hour, delegates and agencies huddled to consider next steps. Members of the General Council on Finance and Administration, which had earlier agreed to withdraw $3 million from the Episcopal Fund and give it to the World Service Fund, reconsidered their action. Instead, they agreed to give general agencies $1.5 million to help compensate them for losses when $12 million was removed from their budgets to create a line item for theological education outside the United States and the recruitment and training of young clergy in the United States. The rest of the evening was spent trying to make certain the budget remains intact and proposed agency reductions are carried out. The agencies proposed to reduce their boards by 266 directors, or about half. Those reductions will move forward because they were not part of the restructuring plan. A demonstrator advocating for a more inclusive church participates in a vigil at the edge of the May 3 session of General Conference. A UMNS photo by Paul Jeffrey. Click on image to enlarge. View more photos. One of the most troubling actions occurred May 3 when some 100 people entered the plenary area following the defeat of an effort to add a statement to the Social Principles that urged unity and co-existence in spite of opposing views on homosexuality. The assembly retained the current stance saying the denomination considers all persons are "individuals of sacred worth [however, the church] does not condone the practice of homosexuality and considers this practice incompatible with Christian teaching." Indiana Bishop Michael Coyner, presiding officer, adjourned the May 3 morning session after only 20 minutes as the singing of protesters made it difficult to conduct business. When the assembly gathered after a longer-than-planned lunch break, Kansas Bishop Scott Jones, was the presiding officer for the afternoon session. Some 100 people seeking changes in denominational policies related to homosexuals gathered around a communion table at the center of the assembly hall. "I feel your pain," said Germany Area Bishop Rosemarie Wenner, president of the Council of Bishops, in an opening prayer. The Rev. Frank Wulf, a supporter of changing the policies and clergy person from the California-Pacific Annual (regional) Conference, offered a second prayer, asking God for a way for the "broken community [to find] a voice that promotes healing and hope." After the prayers, the demonstrators left peacefully. Since only the morning session had been set aside to discuss issues related to human sexuality, the conference did not address petitions calling for changes in the present policy of denying clergy the right to conduct services of union for persons of the same gender or policies prohibiting the ordination and appointment of self-professed practicing homosexuals. An earlier "holy conversation" on issues related to human sexuality also was cut short because of an extended discussion on the rules. Difficulties with homosexuality did not originate in Tampa, and the journey through these difficult waters will not end here. Advocates for change proclaimed they will not leave the church; they will live out their calling within the denomination. The Judicial Council decision does not significantly affect budgets approved by the assembly. General Conference approved a quadrennial budget of $603.1 million for seven general church funds during 2013 to 2016; that total is 6.03 percent less than the amount apportioned in the 2009 to 2012. That sounds like a whopping amount, but local churches should not count on huge savings, since only 2 cents out of every dollar in a collection plate goes to support general church ministries. Delegates approved two new line items in the World Service Fund. They created a $5 million fund for theological education in central conferences church regions in Africa, Europe and the Philippines -- and $7 million to recruit and train young clergy in the United States. That action, combined with earlier recommendations to reduce agency budgets by 6 percent, means general agencies will receive nearly 10 percent less money in 2013-16 than they received in 2009-2012. That action will be softened by a grant of $1.5 million from the General Council on Finance and Administration to the World Service Fund. That grant is partly the result of the finance agency decision to reduce the Episcopal Fund by $3 million. Agency members also granted $1 million to help offset deficits experienced by the Commission on General Conference and returned $500,000 to the General Administration Fund. While agencies may experience some savings in a reduced number of agency board members, those savings will be less than the 10 percent reduction in funds and the rate of inflation over the next four years. Since all local churches do not pay the full apportionments, the amount received by all funds is less than the amount budgeted. The Rev. 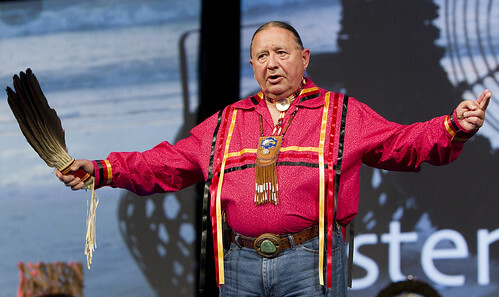 George Tinker preaches during an "Act of Repentance toward Healing Relationships with Indigenous Peoples" on April 27. A UMNS photo by Mike DuBose. On Friday, April 27 before legislation reached the plenary floor, delegates participated in "An Act of Repentance toward Healing Relationships with Indigenous Peoples," recognizing and repenting of actions taken against Native peoples of all nations. In a moving ceremony in the plenary hall, they confessed that the church has "participated in the violation, the exploitation, and even the killing of indigenous people." At the close of the service of repentance, delegates picked up symbolic stones from the "river of life" scattered in the worship area. They were asked to take them back to their communities "as a covenant to continue to listen and to walk the journey of healing with one another." Many delegates were surprised when the conference placed a proposal that would effectively end guaranteed appointment for clergy on the consent calendar, a device used to expedite legislation when there are fewer than 10 members of a legislative committee opposed to a proposal. After a few delegates discovered what they had passed, an attempt to reconsider the issue was rejected by a margin of 564 to 373. On May 4, the final day of the meeting, the conference agreed to ask the Judicial Council for a ruling on whether the measure violates the Constitution. That ruling will come at a later meeting of the Judicial Council. Delegates were far more cautious on other issues. Less than the required two-thirds of the delegates voted to seek a constitutional amendment that would allow for a bishop to serve as president of the Council of Bishops without responsibility for overseeing a geographic area. They also didn't approve a proposed amendment to allow budgets to be adjusted between sessions of General Conference. Somewhat like the advance billing for a high wire act that turns out to be a foot off the ground, so too, this General Conference was billed as the assembly that would make the most sweeping changes since the 1968 formation of the denomination. 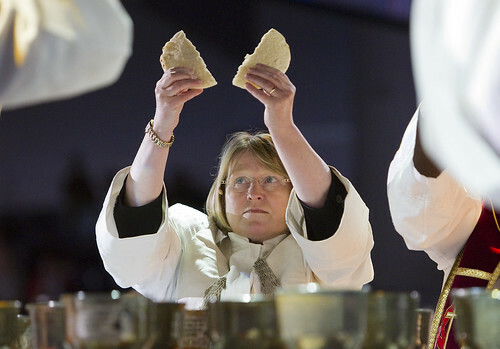 Bishop Rosemarie Wenner blesses the elements for Holy Communion during opening worship at the 2012 General Conference in Tampa, Fla. A UMNS photo by Mike DuBose. Click on image to enlarge. View more photos. By the time exhausted delegates shuffled their way out of the assembly hall shortly before 11 p.m., the denomination looked very much like it had before the delegates arrived. Bishop Rosemarie Wenner of Germany, the new president of the Council of Bishops, sent the delegates forth on an encouraging note during the conference's closing worship. "At the end of all our business unfinished though (it is), as we are ready to go, let us pause for a moment," she said. "Let us listen as the risen Christ says to us, 'Fear not! I am with you. And, therefore, follow me.'"